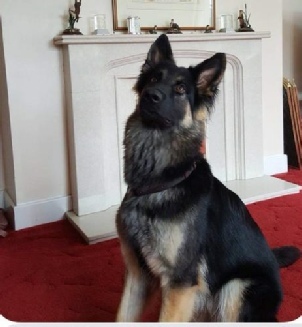 Harley has gone to live with Sue, and her family, in Stoke On Trent, Staffordshire and she is getting used to Sue's prize chickens. Harley has settled in well and is now called Hollie. 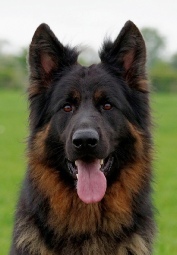 Harley is a black and tan, heavy coat girl with oodles of personality and who is searching for a forever home after being returned to her breeder through no real fault of her own. She was born on 15th September 2017 is the daughter of Phoenix and Cruz. Harley is a very happy and friendly girl with lots of drive for her ball and food. She would do extremely well in an environment where she could use her brains and energy, especially agility or fly ball. She is not a sit at home type of dog as she is extremely active. Harley would be best suited on a One to One basis and without any other household pets to distract her. She would happily work hard with the right guidance. Harley is a house dog and would not suit living alone out doors in a kennel situation and she certainly isn't a guard dog. 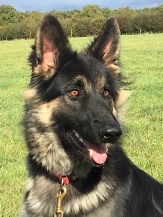 She is searching for an experienced handler, who understands her active mind and can work on her recall and general obedience skills. 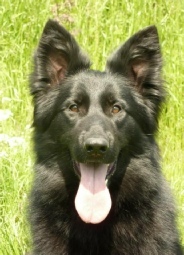 Harley would repay her new owner with loyalty, love and devotion. 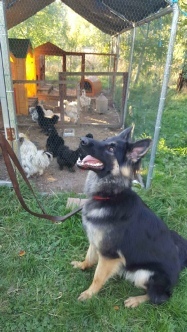 Please do not consider Harley if your household work all day or you are a first time German shepherd owner as she would not be suitable for either of these environments. She needs time to develop her skills and training ability with someone who can give their time to her as she is still very young and immature and therefore could be quite a challenge.